The wave swept me up into the sky. I looked out at the wild sea, at the cliffs of rock stretched for miles, at the foaming white chaos where they met. The wave pushed by and I fell, sliding down, down, down into a blue walled canyon. Everything but water disappeared. Gravity caught my stomach and I felt heavy for a moment until the next wave came like a rolling hill and swept me back into the world. I looked at the rock walls again, at the waves smashing into them, at the foam spitting into the sky. The waves sounded like thunder breaking. The roar echoed in the air. I felt a wild flash of terror and swallowed at it, trying to keep it in, trying to bury it underneath me, but the fear leapt forth, dancing over my eyes as I rose and fell. I felt so alone, to tiny against the power moving past me and hurtling into the rocks, wanting to take me with it. 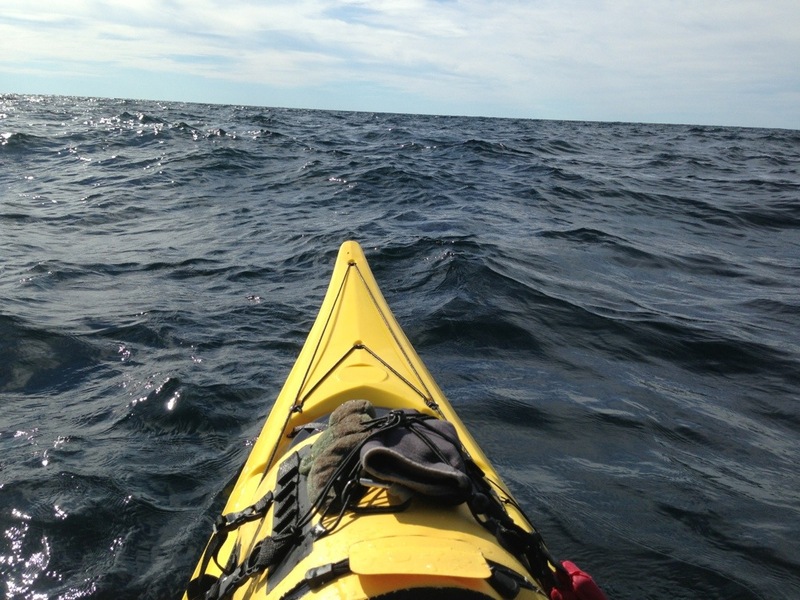 I breathed out the thoughts and felt the sliver of plastic underneath my heels, the tiny metal cords of the rudder, the thin blades of my paddle. How many times have I leaned on them, how many times have they held that thin line between me and Superior’s will. I thought of yesterday’s mistake, of watching the water drain out from underneath me and a rock rush up, feeling the hull scrape and catch, the boat spin sideways, and the awful pause before the wave rushed back in and hit me in the chest. It happened so fast, like flicking a light switch. I looked at the rock wall, at the water rushing into it, and caught up to my fear, swallowed it down. I had to press on because there was nothing else to do. I couldn’t stop. I couldn’t flee to land. No one could help. No one even knows. I am all alone hanging off the edge of the world. But that is beautiful too. Floating in the wild of Superior. Watching giant waves crash into shore. Seeing blue water turn to white foam. Staring at cliffs along a jagged coast. Feeling almost swept away, but not quite. I breathed again. The fear fled over the next wave. The beauty remained. And I went on. Posted in Angle to Key WestTagged Angle to Key West, big waves, fear, lake superiorBookmark the permalink. Be careful and wise my friend. You sure take my breath away! Now I’ve gotta wait until tomorrow to see what happens next! Guess I’ve gotta breathe until then.